Click Here to view a brochure detailing the opportunities at RiverBend. RiverBend is located in the City of Buffalo, NY, on the site of the former Republic Steel and Donner Hanna Coke facilities in South Buffalo. The site is located within the South Buffalo Brownfield Opportunity Area (SBBOA). The RiverBend Master Plan is a component of the Step 3 Implementation Strategy of the SBBOA. 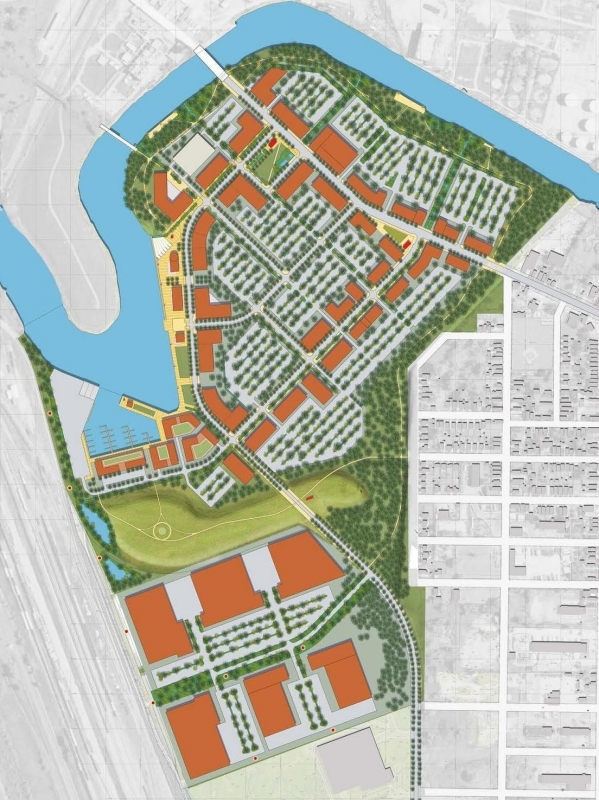 This plan lays out a land use and development strategy for the RiverBend site, a key element of the BOA that encompasses over 200 acres in the heart of the City of Buffalo. A component of this development strategy, The Green Infrastructure Plan, is an essential piece of the public realm improvements that will initiate development at the RiverBend site. These improvements will transform a vacant former brownfield site into a recreational, ecological and economic resource; opening waterfront access, improving connectivity, and reclaiming land for productive use in the City of Buffalo. Preparation of the Plan was funded by the New York State Department of State and National Grid. To read about the formulation of the Master Plan, click here.